Thursday I was 10 weeks and I suddenly realized that meant 25% through my pregnancy. Wow! That was a bit of a shock… But a good, happy shock if you know what I mean. It seems like my symptoms are getting a bit better – I’m not nauseous every day anymore and I think I’m managing things quite well, by eating regularly and avoiding things like standing too long. But that said, I still felt pretty horrible on Monday, I was nauseous from the moment I got up in the morning until I went to bed that night and Wednesday I was very dizzy quite a few times during the day. Also on Wednesday night I suddenly felt like I was getting sick with flu, or a cold or sinusitis or something, but as I know God does not want us to be sick I decided to fight this bug. I really don’t want that at this stage of my pregnancy. I’m still tired but I’ve noticed that by 17h00 or 18h00 if I haven’t had a nap that I have some more energy and that I can actually make it to 21h00 or 22h00 before I have to go to bed. Mostly if I do take a nap, which is only about 3-4 times a week I take it from about 16h30 until 18h00. Those days DH has to cook dinner, but he is so awesome, he does not complain at all! I have an appointment at the foetal assessment centre on 8 June for a Foetal assessment scan, and from what I’ve read this scan is amazing. Some say the best scan during your pregnancy so I’m looking forward to that. I still feel a little lost as I haven’t decided on an obgyn or a midwife yet. I have had second thoughts about the obgyn I initially made an appointment with. I moved that appointment as it was for 10 June and I can’t see the point of going for scans 2 days apart, but I’m thinking of cancelling altogether. This doctor came highly recommended to me by 2 of my cousins, but she is so expensive! I know my medical aid will pay some towards the fees, but I think it’s more an issue of principle at this stage as she charges half as much more than what my FS charges and he is a specialist! So I am looking at other options and one of them is getting a midwife. I really would like to have a natural birth. My mom had c-sections with both my sister and I and my sister also had 2 c-sections, but I’m not going to worry about whether I would also need a c-section as I know God’s perfect plan and design is for us to give natural birth and I believe that He has created me perfectly and healed me completely so I’m believing all will go well. Here in South Africa the standard practice with most obgyn’s is to advise their patients to have c-sections, and very rarely these days the women who go to obgyn’s get to give birth naturally. There are really only a few ladies I know in real life that has given birth naturally in the past 10 years or so. My sister lived in the UK for a couple of years and there they rarely give birth via c-section, only when there are complications, and my sister was one of those rare cases with the birth of her first daughter. So she has been very vocal about all the c-sections being done here in South Africa and I guess that laid the foundation for me to not want one. Then I read Super.natural Child.birth and I learned what God wants for us, and easy natural pregnancies are achievable when you believe in it. Lastly a dear friend (K from New Zealand, Hi K!) told me about a documentary called The Busi.ness of Be.ing Bo.rn on You Tube and after watching that I was totally convinced that natural birth is best. All I can say is God is so good, He is so faithful, and He is so amazing! Nothing is impossible for Him! The last few years I was somehow touched every time I read the story of the woman with the issue of blood in the Bible. I think it had to do with the fact that she suffered for many years (12 years) and was healed. It gave me hope somehow that even if you have a condition for many years that you can still be healed. I think the fact that it was a gynecological problem made me also identify with her. More recently I have learnt even more about this woman and her circumstances that make me admire her. We don’t always understand the significance of specific details, because the way we live and our culture is so much different today than it was in Biblical times. The fact that she was permanently bleeding meant that she was unclean in the eyes of the Jews and the priests. When this woman went out in Public she was supposed to shout “Unclean! Unclean!” every now and then to warn the people around her that she was unclean so that they would not accidently touch her and become unclean themselves. All unclean people had to do that – there were many rules about what made a person unclean, but this permanent haemorrhaging of blood was only one of the causes. There was actually a law that said that they could stone an unclean person to death should they cause other people to become unclean too. Unclean people’s lifestyles were severely restricted in those days – they could not come into the temple, they could not participate in any of the religious ceremonies and I’m sure other people did not treat them well. It says they were cut off from the community – can you imagine living like that for 12 years? So this woman actually took a huge risk by getting into that crowd that pressed so close to Jesus. There was no way that she was able to touch Jesus’ hem without touching a lot of other people too. And then Jesus turned around and asked who touched Him. That was why she was trembling with fear when she admitted it was her. She was healed, but she could still receive the death penalty for causing other people to become unclean. There is another significant fact in this story. It says there was a large crowd pressed around Jesus – now I’m sure at least some of those people also had some kind of ailment or disease. But it’s only mentioned that this woman got healed. Why didn’t the others also get healed? Surely they must have touched Jesus too? It’s because she decided beforehand that if she touched Jesus’ clothes that she would get healed. There is nowhere else in the Bible that it mentions something like this. No one else got healed in this way, certainly not before this woman got healed like this. So it was something that she must have thought of herself and believed that it would happen. That is why Jesus said her faith has healed her. Another important fact is that she was healed without Jesus even being aware of her. So He didn’t know that she was going to touch His garment and that He would heal her this way. He only became aware of her healing when He realized that power had gone out of Him. Many different places in the New Testament it says that Jesus and even His disciples healed everyone. So this is just one more way to prove that Jesus wants to heal everyone. It’s not God’s will for some to be healed and for another not to be healed. He wants healing for everyone and if you believe, if you do the right things healing will come automatically. In this case all she did was to decide beforehand that if she just touched the clothes of Jesus’ she will be healed, she believed it, acted upon it and it happened automatically. I’ll be posting the scan picture again under pregnancy pictures but this one is not so clear. They used a different machine than last time and the FS even had to press down quite hard on my tummy to get a sort of decent picture. 200th Post and an Award! I can’t believe it’s my 200th post! I almost missed this milestone. 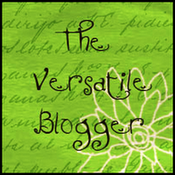 Kitty gave me the Versatile Blogger award, thank you Kitty! 1) Winners- Put the above image in your blog. 2) Include a link back to the person who gave it to you. every 6 weeks or so. The first colour I picked had a hint of auburn in it on the picture of the box but after colouring, it came out bright red! So I bought another box and dyed it again – this time I picked lightest brown, and I’m happy with the colour now. DH joked that he had a blonde, a redhead and a brunette all in 1 day! The only other time I did not have blonde hair was when I was born, apparently it was red. But in all the baby pictures I’ve seen my hair is blonde so I think it must have gone blonde quite quickly. The day we moved out our house before we went to the Netherlands my sister was so upset that she clung to the gate and screamed! She didn’t want to leave our house and my parents had to pry her loose from the gate. I can still remember that clearly! I’ve always loved to read – As I child it was the highlight of my week if my mom took us to the library. Even now I still read a few books a week. One of my dreams is to make a quilt one day, but I must say I feel a bit intimidated by the idea… I saw recently that there is someone that does a course on it close to our home and if I had the time and money I would love to do the course. My current dream is to buy our own house again, hopefully a fixer upper that I can renovate and decorate to my taste. DH and I have done that before and we absolutely loved it. It didn’t feel like work at all. I don’t drink alcohol at all or eat lamb or mutton. I think it’s because of the yellow jaundice I had when I was a child. Fatty foods and alcohol make me feel sick and make me vomit. So I avoid it at all costs. 7. Hanneke at To Be or not to Be. That is the Question? Today I’m 8 weeks pregnant. I can’t believe I’ve known I’m pregnant for just over a month already! I had my 3rd Intralipid drip today and it should be my last one. Originally the FS said I needed one at 4 weeks, 6 weeks and 8 weeks. I’m going for a second scan in a week’s time and then we will hear what the FS has to say, but I think it will be my last appointment there. I’ve found that eating regularly, small portions and healthy food is best for me. Eating does not really make me feel better but it keeps me from feeling bad when I get too hungry. I think it must be my blood sugar level that drops too low, and then it takes a long time to feel better again. I’m also getting dizzy if I stand for too long. Other than all that I’m doing well and I must say I’m not complaining, just saying… It is so worth it all! It’s been such a long time since I’ve blogged about KT. She has grown so much; she is almost as big as Shumi, which is a surprise as her parents weren’t so big. I think it’s the food that we feed them, because all our boxers were or are big, but most of their parents weren’t so big. Anyway, back to KT – she is very sociable; she is also incredibly loved by everyone that lives here in our estate. DH took them all for a walk the other day and he saw one of the ladies that live here walking behind him, pushing her stroller with her 1 year old baby inside. This couple has 2 children – a bigger daughter of about 5 or 6 year old and then the little one who turned 1 in March. They rent from the developer and DH thought that she was looking for the owners of their house as she was walking very fast and determined down the road. DH knew that she wouldn’t find them at their house as he saw them elsewhere while he was walking the dogs. It warms my heart that our dogs are so loved by our neighbours. Our other neighbours who own Tess the little black dog in the video also love KT to bits. Every morning they give their dogs a chicken neck and every afternoon they get a bone. KT knows about this ritual and she is always there to collect one for herself too. DH has a new nickname for KT – he calls her stretch, because she sleeps stretched out and seems so long. I have said to DH that we should have named her happy, because she seems happy all the time. It almost looks like she is smiling constantly. 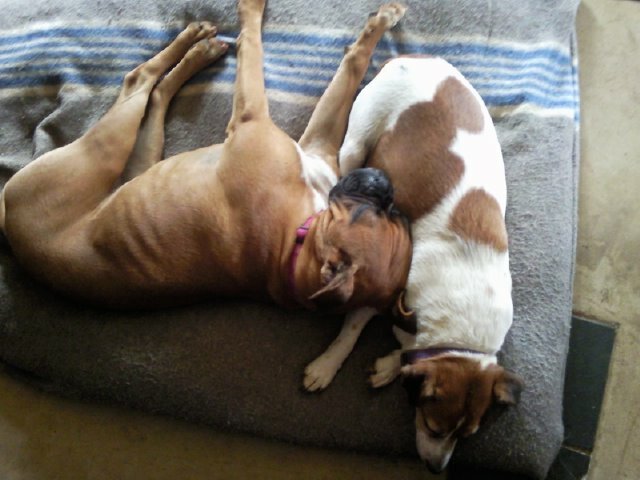 In the photo below she is not quite stretched out, but she is using Nandi as a pillow! Here is a video of KT and Tess playing. They are so entertaining! I must say I haven’t been able to get a video of them playing with KT bouncing around. It looks like she has springs on the bottom of her feet to help her bounce. But this was the best I could get. Somehow when I take a camera or my phone out to record them they stop the funny antics!